'Bao' Is The First Pixar Short Directed By A Woman Bao was written and directed by Domee Shi, who started working at Pixar as an intern. It tells the story of a woman who discovers joy — and sorrow — when a steamed bun she makes comes to life. 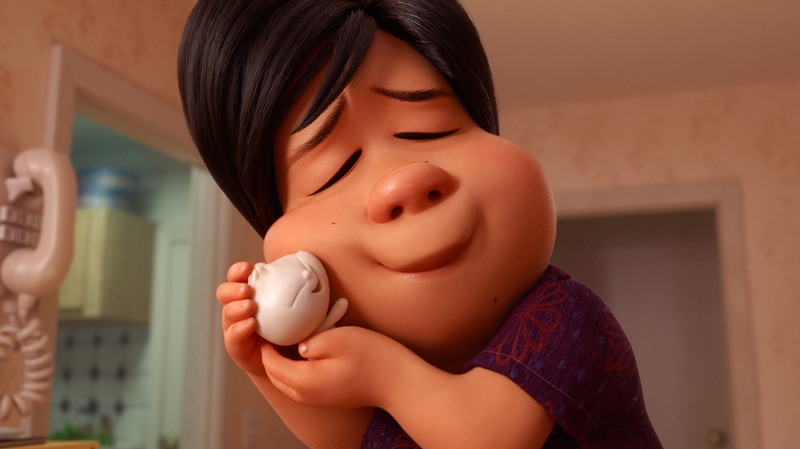 In Bao, a Chinese woman with empty-nest syndrome finds relief when one of her dumplings springs to life. Moviegoers sitting down to see Incredibles 2 are in for a tasty treat in the form of an animated short called Bao. It tells the story of an empty nester who discovers joy — and sorrow — when a steamed bun she makes comes to life. The story is pulled from the childhood of Domee Shi, who wrote and directed the Pixar film. Shi was born in China and raised in Toronto. She started working at Pixar as an intern in 2011, and now she's the first woman to direct a Pixar short. Pixar and the larger animation industry have been criticized for shutting female animators out of top jobs, but Shi says that culture is changing. "You're just seeing this gradual shift in the industry because, before, animation was predominantly white and male, but now in animation schools all over the country enrollment is now over 50 percent female. ... I think just more and more girls are just getting into animation. And I hope that we're going to see those numbers be reflected in the industry and not just in the animation schools." I feel so honored and humbled to be in this position, for Pixar to have liked this weird idea I pitched to them and to get behind it. Yeah, I just think it was a combination of just timing and really awesome support from really cool people, and embracing my weirdness and not being afraid to show it. Because at first I was kind of hesitant to pitch this idea, but then [Pixar veteran] Pete Docter — who has been kind of my mentor figure this whole time, I worked with him on Inside Out — he was really an early supporter of the short, and he encouraged me to stick to my guns to pitch the original version of the short. And I'm so glad I did because that was the reason why Pixar chose that idea. I think I was probably really hungry one night, and I've always been a huge fan of classic fairy tales. And I wanted to do like a Chinese twist on "The Little Gingerbread Man" with a Chinese dumpling, instead of a little cookie, that comes to life. And I drew a lot of inspiration also from my own personal life. I'm an only child, and I feel like ever since I was little my Chinese mom and dad have always treated me like their precious little dumpling. And also, growing up, my mom would often hold me close and be like, "Oh, I wish I could put you back in my stomach so I knew exactly where you were at all times." And like, "Oh, mom, that's creepy, but sweet." ... I just want to explore that feeling more — like, why does she want to do that to me? We brought her in twice to do dumpling-making classes for the whole crew. Yeah, and it was great. Like, we got the animators and effects artists right in there, and they studied my mom's techniques and they poked the dough and smelled the pork filling. ... It was really important for us to get every single detail right ... so we can put it on screen. She saw it ... for the first time at the wrap party and she really liked it. I think she got emotional. She's like me, she is very like subtle with her emotions. But I definitely took a peek to my left during the short and I think I saw her eyes getting misty. Danny Hajek and Melisa Goh produced and edited this interview for broadcast. Nicole Cohen adapted it for the Web.